Can you see Yellowstone in a day? Most say no, I say YES! If you’ve been following along with our trip, you’ll know that our planned trip to Grand Teton National Park and Yellowstone National Park got all kinds of messed up because of forest fires. Sure, it’s inconvenient, but when you head out into nature, you have to be flexible. Forest fires (that aren’t human-set) are an important part of forest succession and as such are necessary. Lightning set the Berry Fire that changed our itinerary so it was left to burn, managed to protect people and property. Because of this fire, the only way we could really do Yellowstone was to drive down from Bozeman, MT and see as much as we could in a single day, returning to Bozeman that same day. Scouring the internet for single day info was discouraging, since pretty much every single blog post, travel guide, etc. that I could find stated definitively that you could not see both northern and southern Yellowstone in one day. But, since we had no choice we packed up the car and said challenged accepted! Our best shot at seeing as much as possible involved driving from Bozeman, Montana to the north gate of the park, then following the scenic drive around the park clockwise to the west gate. 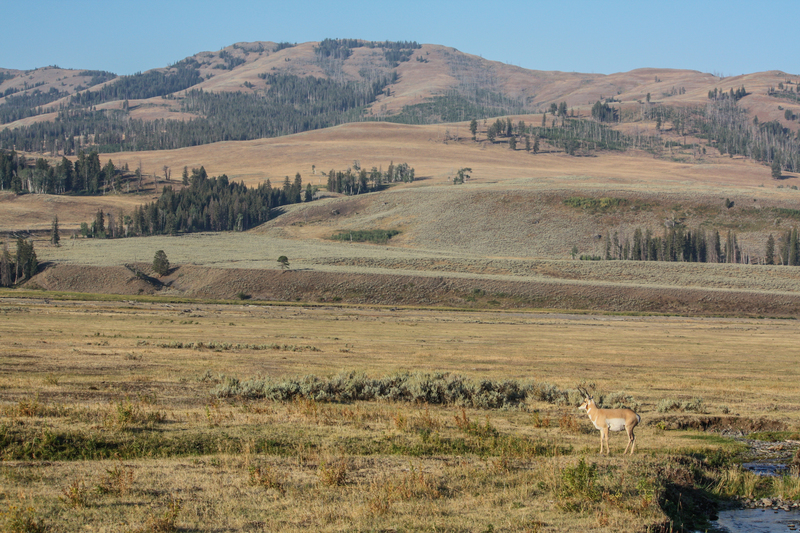 We would stop for attractions along the way and take a side drive to Lamar Valley. We knew it would be an extremely long day. So we decided to take the dogs along! No dogs allowed on trails, so no hiking. That was OK, we wouldn’t have time for hiking anyway. Below you’ll see our stops (zoom into the map to see individual markers) and I’ll add timestamps from our trip that you can use to plan your own Yellowstone adventure. Keep scrolling to see pics, videos and read about our awesome Yellowstone day trip! To enlarge any photo, just click on it! We entered Yellowstone National Park at 6:38 AM headed straight for Lamar Valley. We knew our best chance at seeing wildlife was around sunrise. Our early start paid off as we watched hundreds of bison and pronghorn graze in the valley. My single biggest piece of advice for visiting Yellowstone is to get yourself out to Lamar Valley early in the morning, it’s so worth it. We drove all the way to Pebble Creek Campground where we turned around and headed back to the Grand Loop Road (this road is closed in the winter, so this trip is only possible in the summer months). We drove a short distance to Tower Junction and stopped at Roosevelt Lodge for breakfast. I don’t think I’ll ever get tired of huckleberries. The huckleberry pancakes at the lodge had just the right amount of berries to keep the pancakes sweet and tart without being overwhelming. The lodge is a cool place to hang out while you wait for your take out breakfast with a small gift shop, general store (where we bought a giant bag of huckleberry twizzlers – a critical component to our day trip!) and nice porch complete with rocking chairs. After a bit of a wait we had our takeout breakfast and were on our way to our next stop. A super quick stop recommended by a ranger. I don’t have a good picture to share here, but this spot is important to the history of Yellowstone. Allegedly, a painting of Tower Fall was an influencing factor in Yellowstone becoming the first national park. We’re lucky so many artists were willing to travel to such remote locations to capture and share nature’s beauty with others. I suppose they were our historical instagrammers. You’ve probably seen a picture from Artist Point, whether on Instagram or another medium. It’s an extremely popular viewpoint and we got a feeling for why in person. This viewpoint allows for a great view of the Lower Falls of the Yellowstone River in the Grand Canyon of Yellowstone. These views always astound me when I think about how water carved this deep canyon. Water seems so soft, neutral, weak, harmless. Then it moves mountains. Amazing. We had a special treat at this stop when a ranger pointed out a porcupine napping in a tree. This guy really knows how to pick a scenic napping spot. After viewing the Lower Falls we took a quick minute to view the Upper Falls of the Yellowstone. This waterfall was really difficult to photograph. At almost noon, the bright summer sun was reflecting strongly off of the roaring waterfall. The whole scene of sun, water and rock was beautiful and worth the quick stop. After viewing some astonishing but fairly routine natural features, it was time to see some of the weirder parts of the park. Finally, we started to see some of the truly bizarre geothermal wonders of Yellowstone. Mud volcano is a hot, stinky pool that looks like a giant mud puddle. The humidity and sulfur smell that come along with this pool are not offensive to, rather welcomed by visitors who are too interested in the bizarre-ness of the park to care. This area of the park is also home to the Dragon Mouth Spring which was one of my favorite geothermal features in the whole park. Gases move hot spring water in this cave, emitting a low rumbling sound. West Thumb is a collection of geothermal features along the western shore of Yellowstone Lake. This stop is a double whammy where you can see some curious geyers and springs while also taking in sweeping views of the largest high elevation lake on the continent. A boardwalk a little short of a mile leads visitors through the geyser basin and is worth the time to walk through the varied pools. There is no protection from the sun on this boardwalk so make sure you’ve got sunscreen and water before leaving the car. I know you’ve been waiting for it and yes, we saw the famous Old Faithful. The geyser is unpredictable, but there is generally a window of time that gives visitors a good idea of when to be alert for an eruption. We just missed one, so had some time to kill. Luckily there is a large general store where we grabbed some lunch while waiting for the next “show”. Shortly after 3:15 PM we finally saw the legendary Old Faithful erupt in a furious spew of steam and water. Sure, there are more unusual and interesting sights to see in this huge park, but I still think it’s worth your time to stop and gawk with all the other tourists at this geologic marvel. Saved the best for last. Grand Prismatic Spring in the Midway Geyser Basin was my favorite feature in the park. It’s a good thing it was cool. The parking lot was packed and we ended up parking about a mile down the road and hoofing it to the viewing area. The unique and extremely delicate microbial mats around the largest spring in the country take on different colors depending on the concentration of substances and temperature of runoff water, and are in an order that creates a rainbow effect. This spring was unreal – it’s hard to comprehend how something this spectacular occurs in nature. The boardwalk viewing area for Grand Prismatic Spring also takes visitors next to Excelsior Geyser Crater, another interesting formation. The water in this spring bubbles while steam rises from the crystal clear water. It almost looks inviting. Except for the 200 F water temperature, that is. This also appears to be the largest umbrella cemetery in the world. Looking closely at the bottom of the pool you start to notice umbrellas and sun hats littering the floor of the crater. From Midway Geyser Basin we headed to the West Entrance of the park and headed back to Bozeman. It was obviously a long and tiring day, but we were able to see the wildlife so famous in the northern part of the park as well as the geothermal features in the southern part of the park in a single day. While I said we didn’t really hike, we did walk two boardwalks that were 0.8 and 0.9 miles long. Combined with all other walking through the day we spent a long time on our feet on this car trip. I wore flip flops and was comfortable, but plan ahead for what you need to enjoy your trip. Packing snacks and drinks will also make this long trip more comfortable. Make sure not to feed any of the wildlife you might encounter in the park. Thanks for coming along on a recap of our trip! I hope this is helpful in planning a quick trip to Yellowstone! Have you ever traveled to Yellowstone National Park? What were your favorite sights? Tell me about them in the comments!